Having bicycled in Europe more than 10,000 self-supported miles and having led cycling tours in nearly every country on the continent, Steve Williams is a well-versed and passionate guide who helps aspiring bike tourists make the most of their trip. 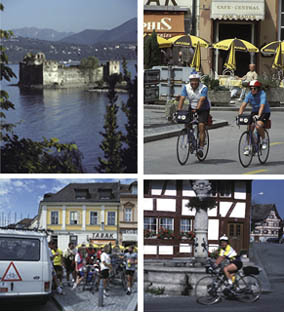 From how to select a bicycle tour company or plan an independent route, to choosing the right bike and gear, to packing tips and cultural do’s and don’ts, this fun, hands-on bike touring clinic is great for bike clubs or bike shops. Illustrated with Steve’s inspiring photography from all over Europe and the UK, and full of humorous anecdotes from his many cycling adventures, this one or two hour session both inspires and informs. Handouts include detailed packing lists and route planning templates.